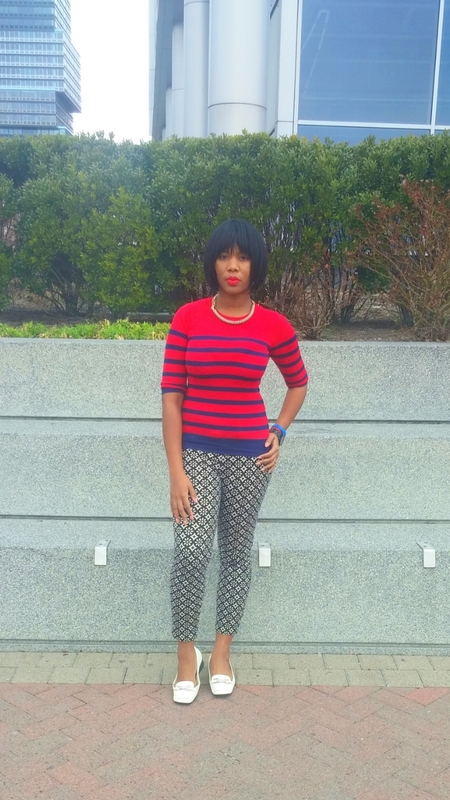 "I've been featuring a lot of prints and stripes lately and I'm loving it! I love these black and white pants. It has a lot of potential and it's extremely comfortable. Last time, I wore it with high heel sandals and a tucked in white shirt. Here I have on flats and an elbow length sweater. Notice how I'm still working it with the same colors as last time (red and white)? This outfit wasn't planned. It kinda happened and that's why I didn't even pause to see if I was following my "mixing prints rule." Though I didn't follow my rule, this look still works well together, which brings me to an additional rule. one of the prints isn't busy. In this instance, blue goes pretty well with black and white combo and red also goes well with black and white. Also, stripes on the sweater aren't very heavy. On another note, something about this outfit makes me want to go sailing."